Maximizing performance while minimizing human error is a requirement of organizations of all sizes. This need is covered by defined processes and workflows, for recurring tasks. Ensuring all required information is available in the right place, and contacts are informed about their responsibilities like adding information, approving requests, etc. OTRS supports this requirement by process management. Process tickets help by using the required mandatory and optional fields (see Dynamic Fields) that information is not forgotten upon ticket creation or during later steps of the process. Process tickets are simple to handle for customer users and agents, so no intensive training is required. Processes are designed completely and efficiently within the OTRS front end to fit the requirements of your organization. Use this screen to manage processes in the system. The process management screen is available in the Process Management module of the Processes & Automation group. Click on the Create New Process button in the left sidebar. 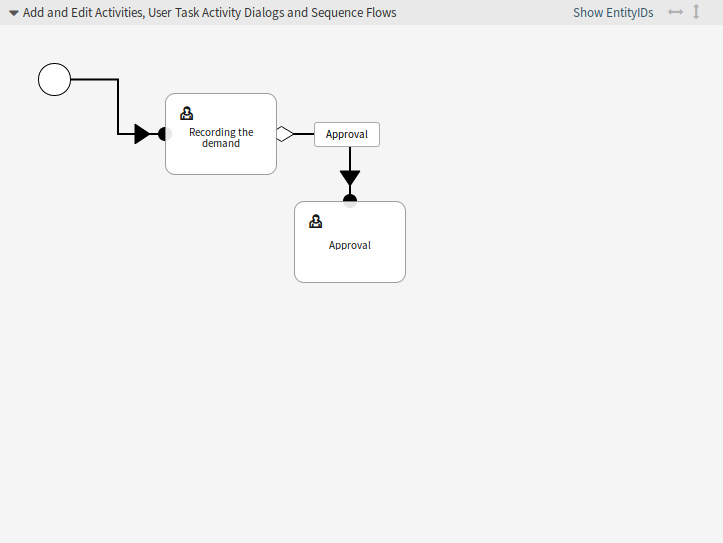 Add activities, user task activity dialogs, sequence flows and sequence flow actions. Click on a process in the list of processes. Modify the fields and the process path. Click on the copy icon in the fifth column of list of processes. Click on the newly created process to edit it. Set the State option to Inactive. Click on the Save button. A new Delete Inactive Process button will appear in the left sidebar. Click on the Delete Inactive Process button. Click on the Delete button in the confirmation screen. Processes are written into file in Perl format. Without deploying, all processes are still in this cache file even if they are deleted or the State option is set to Inactive or FadeAway. Don’t forget to deploy all processes after modifications! Processes can be used in new process tickets. Processes cannot be selected any more for new tickets, but existing tickets still can use the process. Processes are deactivated and cannot be used for new or existing tickets. Click on the Deploy All Processes button in the left sidebar. New or modified processes have to deploy in order to make affect the behavior of the system. Setting the State option to Active just indicates, which processes should be deployed. Click on the export icon in the fourth column of list of processes. Choose a location in your computer to save the Export_ProcessEntityID_xxx.yml file. The exported file contains only the process itself, and doesn’t contain the Queues, Agents, Dynamic Fields, etc. needed for the process. Click on the Browse… button of the Configuration Import widget in the left sidebar. Click on the Import process configuration button. Before import a process, it is still necessary to create all Queues, Agents and Dynamic Fields, as well as to set System Configuration, that are needed by each process before the import. If the process requires the use of Access Control Lists (ACL) those are also needed to be set manually. If several processes are added to the system, use the filter box to find a particular process by just typing the name to filter. Processes are more complex than other resources in OTRS. To create a process, you need to do several steps. The following chapters shows you, how to define a process from the specification and create the needed resources. Let’s see an example to make it more demonstrative. We will define a book order process. The book order process has four states. The head of the employee’s department needs to decide on the order. In case of a denial, a reason should be recorded by the manager. In case of approval, the order is passed to the purchasing department. Purchasing now has the task to find out where the book can be ordered with the best conditions. If it is out of stock, this can be recorded in the order. In case of a successful order purchasing will record the supplier, the price and the delivery date. The shipment will arrive at the company. The incoming goods department checks the shipment and records the date of receipt. Now the employee will be informed that their order has arrived and is ready to be collected. If we assume that a ticket acts in this workflow like an accompanying document that can receive change notes, we already have a clear picture of process tickets. Possibility to record data, let’s call this user task activity dialog. Check which can react to changed data automatically, let’s call this sequence flow. Change which can be applied to a process ticket after successful transitions of a process ticket, let’s call this sequence flow action. A possibility to offer more than just one user task activity dialog to be available. In our example this is needed when the manager must have the choice between Approve and Deny. Let’s call this activity. 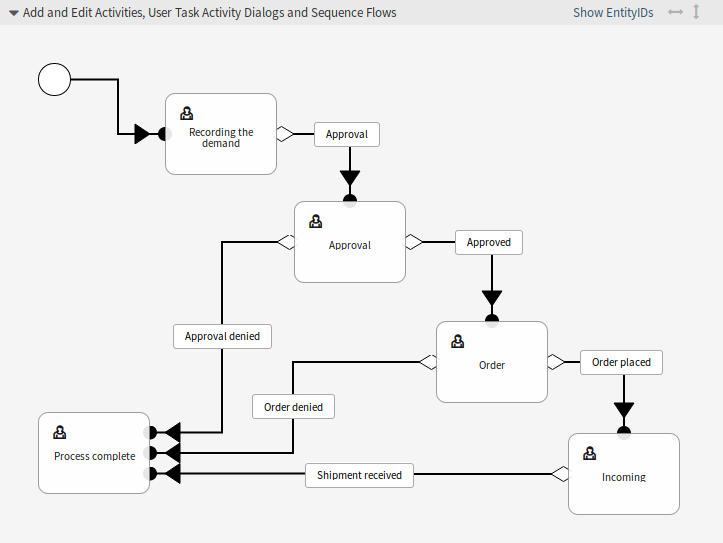 Now, with activities, user task activity dialogs, sequence flows and sequence flow actions we have the necessary tools to model the individual steps of our example. What is still missing is an area where for each workflow the order of the steps can be specified. Let’s call this process. Before the creation of the process and its parts is necessary to prepare the system. We need to define some Queues, Agents and Dynamic Fields as well as set some System Configuration settings. Don’t forget to deploy the modified system configuration settings. Now, go back to the Process Management screen and click on the Create New Process. Fill in the required fields. The new process is created. You can add some process element now. 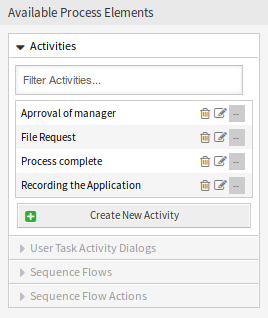 Click on the User Task Activity Dialogs item in the Available Process Elements widget in the left sidebar. This action will expand the User Task Activity Dialogs options and will collapse all others doing an accordion like effect. Click on the Create New User Task Activity Dialog button. In the opened popup screen fill in the Dialog Name as well as the Description (short) fields. For this example we will leave all other fields as the default. To assign fields to the user task activity dialog simple drag the required field from the Available Fields pool and drop into the Assigned Fields pool. The order in the Assigned Fields pool is the order as the fields will have in the screen. To modify the order simply drag and drop the field within the pool to rearrange it in the correct place. DynamicField_Title, DynamicField_Author, DynamicField_ISBN fields for the data to be collected for the order. DynamicField_Status with the possibility to choose Approval. Drag these fields from the Available Fields pool and drop into the Assigned Fields pool. In this screen all dynamic fields has the prefix DynamicField_ as in DynamicField_Title. Do not confuse with the field Title that is the ticket title. As soon as the fields are dropped into the Assigned Fields pool another popup screen is shown with some details about the field. 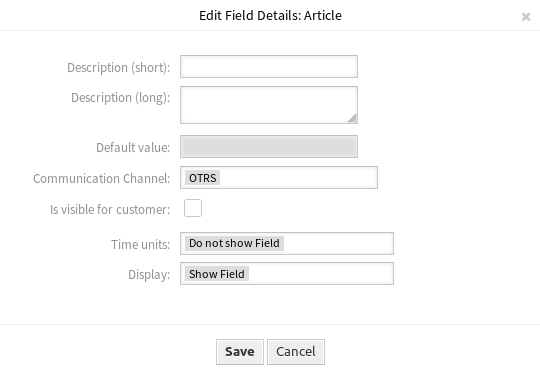 We will leave the default options and only for Article fields we should make sure that the Communication Channel field is set to OTRS and that the Is visible for customer is not checked. After all fields are filled in, click on the Save and finish button to save the changes and go back to the project management screen. DynamicField_Status with the possibility to choose Approval denied. DynamicField_Status with the possibility to choose Approved. DynamicField_Status with the possibility to choose Order denied. DynamicField_Supplier, DynamicField_Price, DynamicField_DeliveryDate fields for purchasing. DynamicField_Status with the possibility to choose Order placed. DynamicField_DateOfReceipt for the mail room. DynamicField_Status with the possibility to choose Shipment received. 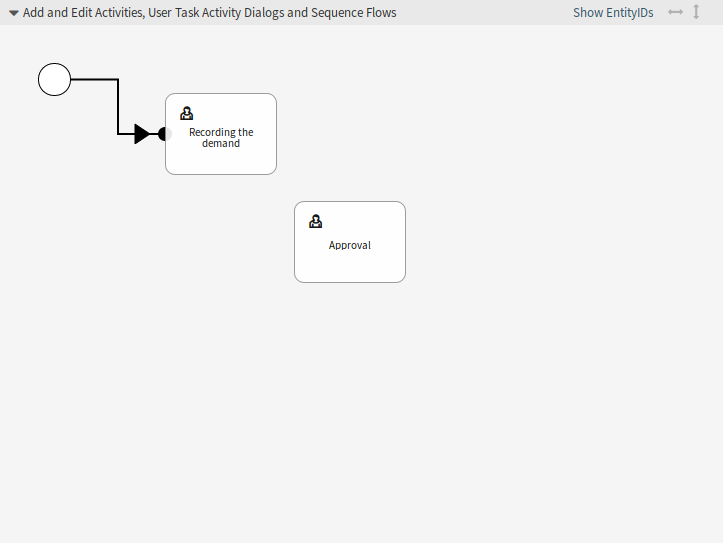 Click on the Sequence Flows item in the Available Process Elements widget in the left sidebar. This action will expand the Sequence Flows options and will collapse all others doing an accordion like effect. Click on the Create New Sequence Flow button. In the opened popup screen fill in the Sequence Flow Name. For this example in the Condition Expressions we will use just one condition expression and just one field. For both we can leave the Type of Linking as and and we will use the filed match type value as String. Check if the DynamicField_Status is set to Approval. Check if the DynamicField_Status field is set to Approval denied. Check if the DynamicField_Status field is set to Approved. Check if the DynamicField_Status field is set to Order denied. Check if the DynamicField_Status field is set to Order placed. Check if the DynamicField_Status field is set to Shipment received. 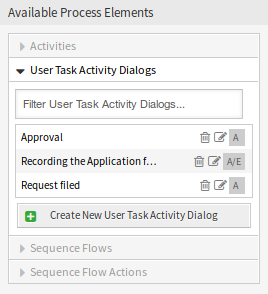 Click on the Sequence Flow Actions item in the Available Process Elements widget in the left sidebar. This action will expand the Sequence Flow Actions options and will collapse all others doing an accordion like effect. Click on the Create New Sequence Flow Action button. In the opened popup screen fill in the Sequence Flow Action Name and the Sequence Flow Action module then click on the Save button. A new Configure button will appear next to the module field. Click on the Configure button and add the needed configuration parameter keys and values. Each module has its own and different parameters. Please review the module documentation to learn all require and optional parameters. All sequence flow action modules are located in the legacy named Kernel/System/ProcessManagement/TransitionAction. To be executed when the sequence flow Approval applied. The sequence flow Approval denied applied. The sequence flow Order denied applied. The sequence flow Shipment received applied. To be executed when the sequence flow Approved applied. To be executed when the sequence flow Order placed applied. To be executed when the sequence flow Shipment received applied. There are places where the same sequence flow actions should be executed. Therefore it is reasonable to make it possible to link sequence flow actions freely with sequence flows to be able to reuse them. Click on the Activities item in the Available Process Elements widget in the left sidebar. This action will expand the Activities options and will collapse all others doing an accordion like effect. Click on the Create New Activity button. In the opened popup screen fill in the Activity name field and select User task activity from the Activity type drop-down. To assign dialogs to the activity simple drag the required dialogs from the Available User Task Activity Dialogs pool and drop into the Assigned User Task Activity Dialogs pool. The order in the Assigned User Task Activity Dialogs pool is the order as the dialogs will be presented in the Ticket Zoom screen. To modify the order simply drag and drop the dialog within the pool to rearrange it in the correct place. This order is specially important in the first activity, since the first user task activity dialog for this activity is the only one that is presented when the process starts. 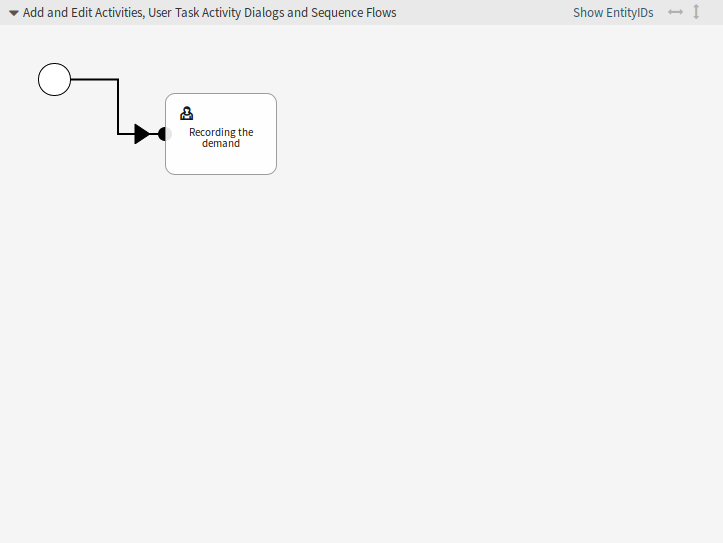 In this example we need to assign only the Recording the demand user task activity dialog. Drag this dialog from the Available User Task Activity Dialogs pool and drop into the Assigned User Task Activity Dialogs pool. Assign the user task activity dialog Recording the demand. Assign the user task activity dialogs Approval denied and Approved. Assign the user task activity dialogs Order denied and Order placed. Assign the user task activity dialog Shipment received. This is an activity without possible user task activity dialogs. It will be set after Approval denied, Order denied or Shipment received and represents the end of the process. Now we can clearly see that activities are precisely defined states of a process ticket. After a successful sequence flow a process ticket moves from one activity to another. Let us conclude our example with the last missing piece in the puzzle, the process as the a flow describer. In our case this is the whole ordering workflow. Other processes could be office supply ordering or completely different processes. The process has a starting point which consists of the start activity and the start user task activity dialog. For any new book order, the first user task activity dialog of the first activity is the first screen that is displayed. If this is completed and saved, the process ticket will be created and can follow the configured workflow. The process also contains the directions for how the process ticket can move through the process. Let’s call this process path. It consists of the start activity, one or more sequence flows (possibly with sequence flow actions) and other activities. Assuming that the activities has already assigned their user task activity dialogs, drag an activity from the accordion in the Available Process Elements widget in the left sidebar and drop it into the canvas area below the process information. Notice that an arrow from the process start (white circle) to the activity is placed automatically. This is the first activity and its first user task activity dialog is the first screen that will be shown when the process starts. Next, drag another activity into the canvas too. Now we will have two activities in the canvas. The first one is connected to the start point and the second has no connections. You can hover the mouse over each activity to reveal their own activity dialogs. Then let’s create the process path (connection) between this two activities. For this we will use the sequence flows. 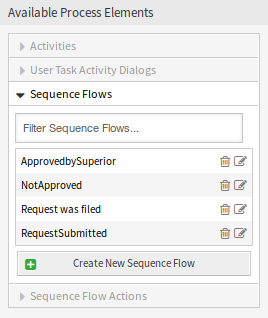 Click on sequence flow in the accordion, drag a sequence flow and drop it inside the first activity. As soon as the sequence flow is dropped the end point of the sequence flow arrow will be placed next to the process start point. Drag the sequence flow arrow end point and drop it inside the other activity to create the connection between the activities. Now that the process path between the actions is defined, then we need to assign the sequence flow actions to the sequence flow. Double click the sequence flow label in the canvas to open a new popup window. After the sequence flow actions are assigned, click on the Save button to go back to the main process edit screen. Click on Save button below the canvas to save all other changes. If the condition of this activity is fulfilled, the ticket will move to activity Approval. The activity Recording the demand is a defined step of the process ticket, where there is the possibility for the sequence flow Approval. 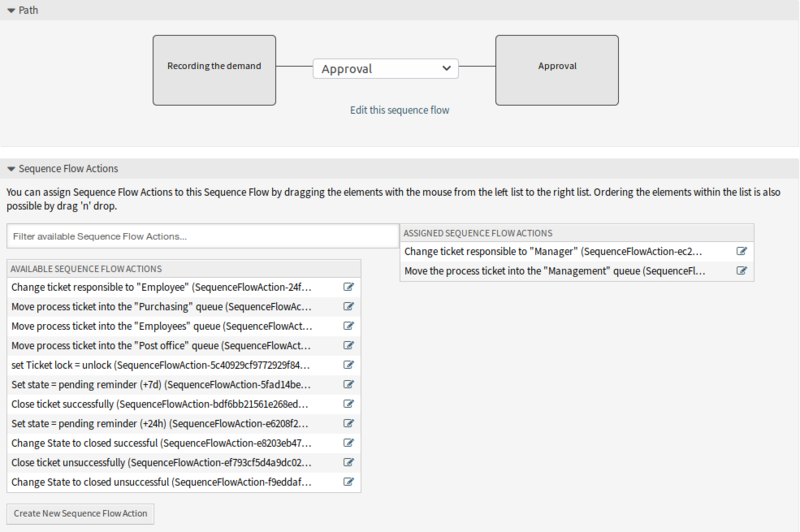 If this applies, the ticket will move to the next activity Approval, and the sequence flow actions Move the process ticket into the “Management” queue and Change ticket responsible to “Manager” are executed. 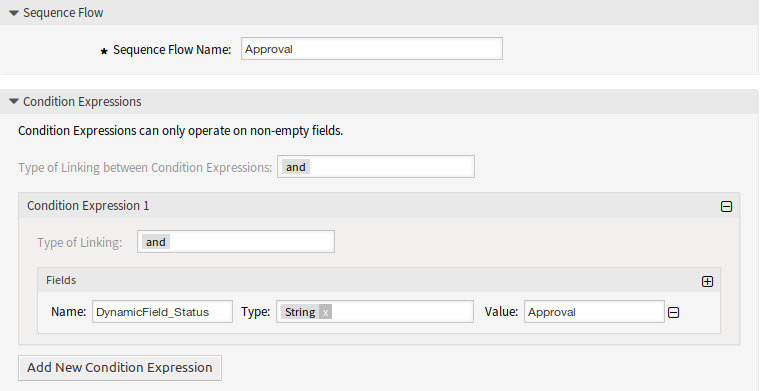 In the activity Approval, the user task activity dialogs Approval denied and Approved are available. If this matches, the process ticket will move to activity Process complete. If this matches, the process ticket will move to activity Order. 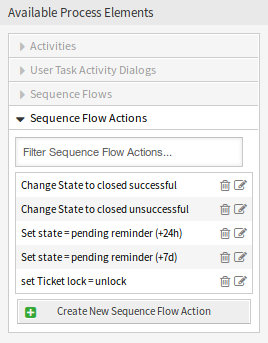 We can see that from the current activity, which defines a step of the process ticket, there are one or more possibilities for sequence flow which have exactly one target activity (and possibly one or more sequence flow actions). If this matches, the process ticket will move to activity Incoming. After you finish the process path, click on Save and finish button below the canvas to go back to the process management screen. Click on the Deploy All Processes button in the left sidebar. This will gather all processes information form the database and create a cache file (in Perl language). This cache file is actually the processes configuration that the system will use to create or use process tickets. Any change that is made on the process will require to re-deploy the process in order to get the change reflected in the system.